Click on the pictures to see in big scale! 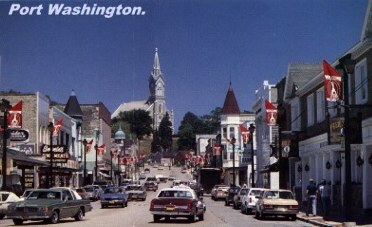 Port Washington in Ozaukee County lies on the shores of Lake Michigan, about 25 miles north of Milwaukee. In 1844, together with other Norwegians Nils and Johannes Jacobsen (later also Tollef) with their families and mother moved there. The boys' mother was Anne Tollefsdatter, née Jøntvedt. She was the widow of Jacob Clausen from the Wærstadkåsa farm in Helgen (Holla 1 p.716), a site today without a house. Nils Jacobsen was a central figure in the congregation and also one of the founders. He was a person known for his wisdom and he was often asked for advice - and not just from the Norwegian settlers. 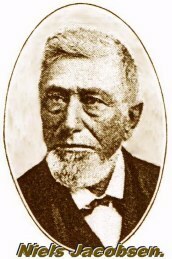 Pastor H.A.Stub, known from Muskego, established the new congregation in Fort Washington. The first church was built seven years later and was also used as a school. 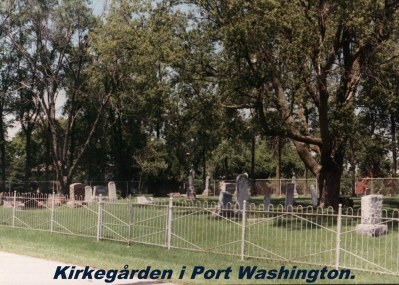 At the same time a graveyard was formed. After some time there occurred a disagreement within the congregation regarding baptism and this resulted in a number (including the Jacobsen family) leaving and forming a new congregation `West Congregation' which existed for many years. Here again they built a combined schoolhouse/church-building on one of the farms in the district. Later, the two churches re-united into one congregation and the oldest church was sold. The Rev. O.H.Lee from Chicago was called to serve Holden in 1881. This the congregation did with `Our Saviours Church' in Port Washington. Holden paid 100 dollars a year for this, and the other congregation paid the rest - 500 dollars. For this, Lee had to officiate at 8 normal Sunday morning services per year together with Ascension Day and Harvest Festival services. 1881 was the first year that they officially took the name of Holden congregation. In 1885 the congregation built a new church, costing 1278 dollars. At that time the old building was in such a state of disrepair that it only fetched 20 dollars! A new schoolhouse was also built alongside. The church had a women's group “The Ladies' Aid” and it was this group that perhaps contributed most to maintain the congregations finances, there being no State help for churches. 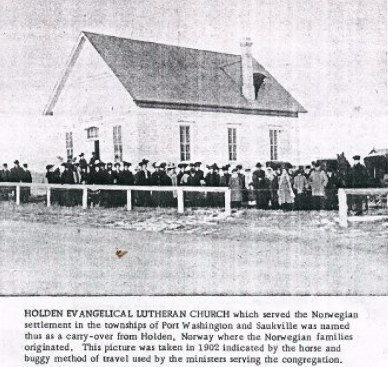 By 1910, however, so many Norwegian families moved away from the area that the church was closed. Apart from the relatively few Norwegian families who established themselves in various parts of the town, most immigrants were from Luxembourg and Belgium. They came later than the Norwegians and in much greater numbers. Today there is virtually no one in the area who has even heard of a Norwegian colony here, or why one of the streets in Port Washington is called `Holden Street'! The church was sold in 1916 altered and converted into a barn. On the other hand the school was in the town's care and used right up to 1961 when it was sold and converted into a house. The churchyards are still in existence however! The oldest nearest the town is not in good condition whilst the newest is well maintained and in good condition. `Holden churchyard - a place of peace' is written on one of the fences and on the markers are found the names of the old immigrants from Holla and other places.